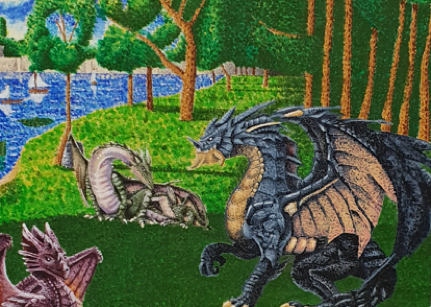 The latest creation to roll out of the KTL Level 2 Art Design and Creative Studies academy is a mixture of the work of Georges Seurat and DragonFest in Germany. Georges Seurat was a French post-impressionist artist who lived between 1859 and 1891. Seurat was famous for his painting techniques known as pointillism. Within his Level 2 studies, Mark undertook research into the work, life and history of Georges Seurat and also researched a non UK event. Mark selected Drachenstich-Festspiele (Slaying of the Dragon) which is a traditional folk spectacle held in Furth in the Bavarian Forest of Germany in August each year. The Dragon Festival includes the world’s biggest fire breathing robotic dragon that walks through the streets of the small village packed with locals and tourists. A key challenge of our Level 2 course is where learners make a hybrid mix of work of their artist and the event they have researched. Mark chose to use Seurat’s famous Sunday Afternoon On The Island Of La Grand Jatte painting and replace the people in the painting with dragons to link to his event. 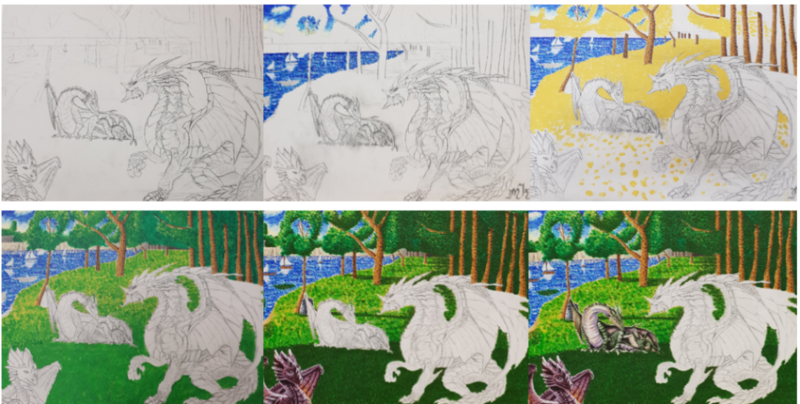 To create his incredible painting Mark started by sketching his dragons and the background of Seurat’s painting. He then started to the painstaking process of applying individual dots of paint to develop the picture working in the pointillism style of Seurat. Even Mark lost count of how many individual dots are on his canvass but it’s safe to say there are thousands. Everyone at KTL is incredibly proud of Mark and his achievements and how wonderful the painting looks and we think Georges Seurat himself would be proud of what Mark has achieved. At the end of Mark’s studies he had not quite finished with his Seurat and dragon them as he used photographs of his painting to create a coaster and placemat set for use at home to be another innovative way of showcasing his excellent work.